The business cycle is the medium-term fluctuation of the economy between periods of expansion and contraction. The business cycle reflects economy -wide shifts and therefore is measured with close consideration of trends in Gross Domestic Product. Business cycles consist of two phases and two turning points. Although termed a cycle, the business cycle does not follow a predictable pattern. More recently, economists describe this phenomenon as economic fluctuations, where the long-run expansionary trend of an economy experiences shocks to the system that create short-term departures. fluctuation: A motion like that of waves; a moving in this and that direction. gross domestic product: Gross Domestic Product (GDP) is the market value of all officially recognized final goods and services produced within a country in a given period. The term business cycle (or economic cycle) refers to economy-wide fluctuations in production or economic activity over several months or years. These fluctuations occur around a long-term growth trend, and they typically involve shifts over time between periods of relatively rapid economic growth (an expansion or boom) and periods of relative stagnation or decline (a contraction or recession ). Business cycles are composed of two phases and two turning points. Expansion: The period of time in which real GDP rises and unemployment declines. It is sometimes called recovery. Contraction: The period of time in which real GDP declines and unemployment rises. A recession is six consecutive months of decrease. A “severe recession” is called a depression. There is no official definition of severe (length and depth). Peak: A peak occurs when the real GDP reaches its maximum, stops rising, and begins to decline. It is determined after the fact. Trough: A trough occurs when the real GDP reaches its minimum, stops declining, and begins to rise. It is determined after the fact. Business cycles are usually measured by considering the growth rate of real gross domestic product. 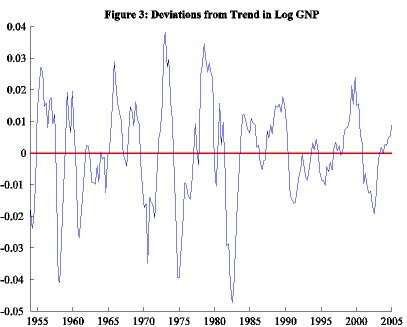 Despite being termed cycles, these fluctuations in economic activity do not follow a mechanical or predictable periodic pattern. The first systematic exposition of periodic economic crises, in opposition to the existing theory of economic equilibrium, was the 1819 Nouveaux principes d’économie politique by Jean Charles Léonard de Sismondi. Prior to that point, classical economics had denied the existence of business cycles; blamed them on external factors, notably war; or only studied them in a long-term context. Sismondi found vindication in the Panic of 1825, which was the first international economic crisis occurring in peacetime. Sismondi and his contemporary Robert Owen, who expressed similar but less systematic thoughts in the 1817 Report to the Committee of the Association for the Relief of the Manufacturing Poor, both identified the cause of economic cycles as overproduction and underconsumption. These believed these problems were caused in particular by wealth inequality, and they advocated government intervention and socialism, respectively, as the solution. This work did not generate interest among classical economists, although underconsumption theory developed as a heterodox branch in economics until being systematized in Keynesian economics in the 1930s. Sismondi’s theory of periodic crises was developed into a theory of alternating cycles by Charles Dunoyer, and similar theories, showing signs of influence by Sismondi, were developed by Johann Karl Rodbertus. Periodic crises in capitalism formed the basis of the theory of Karl Marx, who further claimed that these crises were increasing in severity and would lead to a Communist revolution. Marx devoted hundreds of pages of Das Kapital to crises. In recent years, economic theory has moved towards the study of economic fluctuation rather than the study of business cycles. However, some economists use the phrase “business cycle” as a convenient shorthand. For Milton Friedman, the term “business cycle” is a misnomer because of its noncyclical nature. Friedman believed that for the most part, excluding very large supply shocks, business declines are more of a monetary phenomenon. Rational expectations theory leads to the efficient-market hypothesis, which states that no deterministic cycle can persist, because it would consistently create arbitrage opportunities. Much economic theory also holds that the economy is usually at or close to equilibrium. These views have led to the formulation of the idea that observed economic fluctuations can be modeled as shocks to a system. In the tradition of Slutsky, business cycles can be viewed as the result of stochastic shocks that on aggregate form a moving average series. However, the recent research employing spectral analysis has confirmed the presence of business (Juglar) cycles in the world GDP dynamics at an acceptable level of statistical significance. Economic indicators are key statistics about diverse sectors of the economy that are used to evaluate the health and future of the economy. Many different economic indicators are tracked in order to evaluate the economy in different ways or from different perspectives. Government agencies, such as the Bureau of Labor Statistics, and private entities, such as the National Bureau of Economic Research, report and compile many useful economic indicators. Economic indicators are used to evaluate the past performance of the economy as well as predict future economic conditions. leading indicator: Leading indicators are indicators that usually change before the economy as a whole changes. Lagging indicators: Lagging indicators are indicators that usually change after the economy as a whole does. economic indicator: An economic indicator (or business indicator) is a statistic about the economy. Economic indicators allow analysis of economic performance and predictions of future performance. An economic indicator is a statistic that provides valuable information about the economy. One application of economic indicators is the study of business cycles. Statistics that report the status of the economy a few months in the past are called lagging economic indicators. One such lagging indicator is the average length of unemployment. If unemployed workers have remained out of work for a long time, we may infer that the economy has been slow. Indicators that predict the status of the economy three to twelve months into the future are called leading economic indicators. If such a leading indicator rises, the economy is likely to expand in the coming year. If it falls, the economy is likely to slow down. To predict where the economy is headed, we obviously must examine several leading indicators. It’s also helpful to look at indicators from various sectors of the economy (which might include labor, manufacturing, and housing). One useful indicator of the outlook for future jobs is the number of new claims for unemployment insurance. This measure tells us how many people recently lost their jobs. If the number of claims is rising, it signals trouble ahead because unemployed consumers can’t buy as many goods and services as they could if they were working and had paychecks coming in. To gauge the level of goods to be produced in the future (which will translate into future sales) economists look at a statistic called average weekly manufacturing hours. This measure tells us the average number of hours worked per week by production workers in manufacturing industries. If the average numbers of hours is on the rise, the economy will probably improve. The number of building permits issued is often a good way to assess the strength of the housing market. An increase in this statistic—which tells us how many new housing units are being built—indicates that the economy is improving because increased building brings money into the economy not only through new home sales but also through sales of furniture and appliances to furnish these homes. Finally, if you want a measure that combines all these economic indicators, as well as others, a private research firm called the Conference Board publishes a U.S. leading index. The Conference Board also publishes a consumer confidence index based on results of a monthly survey of 5,000 U.S. households. The survey gathers consumers’ opinions on the health of the economy and their plans for future purchases. It’s often a good indicator of consumers’ future buying intent. GDP is defined as the value of all the final goods and services produced in a country during a given time period. GDP per capita is often considered an indicator of a country’s standard of living. The product approach sums the outputs of every class of enterprise to arrive at total GDP. The expenditure approach works on the principle that all products must be bought by a consumer; therefore, the value of the total product must be equal to consumers’ total expenditures. The income approach measures GDP by adding the incomes that firms pay households for factors of production — i.e., wages for labor, interest for capital, rent for land and profits for entrepreneurship. GDI: gross domestic income; the total income received by all sectors of an economy within a nation. GDP: Gross Domestic Product (Economics). A measure of the economic production of a particular territory in financial capital terms over a specific time period. GDP is the value of all the final goods and services produced in a country during a given time period. Intermediate goods are not counted because they would cause double-counting to occur. GDP only refers to goods produced within a particular country. For instance, if a firm is located in one country but manufactures goods in another, those goods are counted as part of the manufacturing country’s GDP, not the firm’s home country. BMW is a German company, but cars manufactured in the U.S. are counted as part of the U.S. GDP. GDP is a measure used by economists to determine how productive a country is on the whole. GDP per capita is often considered an indicator of a country’s standard of living. Under economic theory, GDP per capita exactly equals the gross domestic income ( GDI ) per capita. The product approach is the most direct, summing the outputs of every class of enterprise to arrive at the total. The expenditure approach works on the principle that all products must be bought by a consumer; therefore, the value of the total product must be equal to consumers’ total expenditures. The income approach works on the principle that the incomes of the productive factors must be equal to the value of their products. This approach determines GDP by finding the sum of all producers’ incomes. Note: In the expenditure-method equation given above, the exports-minus-imports term is necessary in order to null out expenditures on things not produced in the country (imports) and add in things produced but not sold in the country (exports). Consumption is normally the largest GDP component in the economy. 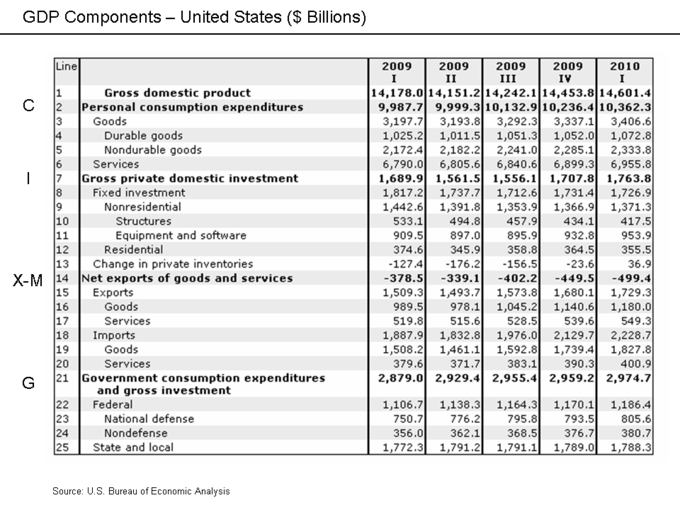 Consumables fall under one of the following categories: durable goods, non-durable goods and services. Examples include food, rent, jewelry, gasoline and medical expenses. Examples of investment include the construction of a new mine, purchase of software, or purchase of equipment for a factory. Spending by households on items like new houses is also included in investment. Buying financial products is classed as saving, as opposed to investment. Government spending is the sum of government expenditures on final goods and services. It includes salaries of public servants, purchase of weapons for the military, and any investment expenditure by a government. It does not include any transfer payments like social security or unemployment benefits. Deducting intermediate consumption from Gross Value to obtain the Net Value of Domestic Output. By collecting data on gross sales and inventories from the records of companies and adding them together. Another way of measuring GDP is to measure total income. If GDP is calculated this way, it is sometimes called Gross Domestic Income (GDI). GDI should provide the same amount as the expenditure method. However, in practice, measurement errors will make the two figures slightly off when reported by national statistical agencies. Map of world showing GDP per capita, 2011: GDP per capita 2011 for the world economy; with the darkest reds being the highest, and the lighter yellows to white being the lowest. Employment level, as defined by cyclical, structural and frictional unemployment, is one of the most important economic indicators. Full employment is defined by the majority of mainstream economists as being an acceptable level of natural unemployment above 0%, the discrepancy from 0% being due to non-cyclical types of unemployment. The Phillips curve tells us that there is no single unemployment number that one can single out as the full employment rate. Instead, there is a trade-off between unemployment and inflation. Cyclical unemployment occurs when there is not enough aggregate demand in the economy to provide jobs for everyone who wants to work. Structural unemployment occurs when a labor market is unable to provide jobs for everyone who wants to work because there is a mismatch between the skills of the unemployed workers and the skills needed for the available jobs. frictional unemployment: A type of unemployment explained by people being temporarily between jobs, searching for new ones. A labor market is regarded as being in the state of full employment if no frictional unemployment is present. structural unemployment: A type of unemployment explained by a mismatch between the requirements of the employers and the properties (such as skills, age, gender, or location) of the unemployed. Employment levels are one of the most important economic indicators available. Full employment, in macroeconomics, is the level of employment rates when there is no cyclical unemployment. It is defined by the majority of mainstream economists as being an acceptable level of natural unemployment above 0%, the discrepancy from 0% being due to non-cyclical types of unemployment. Unemployment above 0% is advocated as necessary to control inflation, which has brought about the concept of the Non-Accelerating Inflation Rate of Unemployment (NAIRU). Governments that follow NAIRU are attempting to keep unemployment at certain levels (usually over 4%, and as high as 10% or more) by keeping interest rates high. The majority of mainstream economists mean NAIRU when speaking of full employment. “The Conservative belief that there is some law of nature which prevents men from being employed, that it is ‘rash’ to employ men, and that it is financially ‘sound’ to maintain a tenth of the population in idleness for an indefinite period, is crazily improbable – the sort of thing which no man could believe who had not had his head fuddled with nonsense for years and years. The objections which are raised are mostly not the objections of experience or of practical men. They are based on highly abstract theories – venerable, academic inventions, half misunderstood by those who are applying them today, and based on assumptions which are contrary to the facts… J.M. Keynes, in a pamphlet to support Lloyd George in the 1929 election. An alternative, more normative, definition describes full employment as the attainment of the ideal unemployment rate, where the types of unemployment that reflect labor-market inefficiency (such as structural unemployment) do not exist. Only some frictional unemployment would exist, where workers are temporarily searching for new jobs. For example, Lord William Beveridge defined full employment as where the number of unemployed workers equaled the number of job vacancies available. He preferred that the economy be kept above that full employment level in order to allow maximum economic production. The Phillips curve tells us that there is no single unemployment number that one can single out as the full employment rate. Instead, there is a trade-off between unemployment and inflation: a government might choose to attain a lower unemployment rate but would pay for it with higher inflation rates. Ideas associated with the Phillips curve questioned the possibility and value of full employment in a society: this theory suggests that full employment—especially as defined normatively—will be associated with positive inflation. NAIRU-SR-and-LR: Short-run Phillips curve before and after Expansionary Policy, with long-run Phillips curve (NAIRU). There are three important categories of unemployment levels that should be understood in order to evaluate the effect of employment levels on overall economic performance: cyclical unemployment, structural unemployment, and frictional unemployment. Cyclical unemployment occurs when there is not enough aggregate demand in the economy to provide jobs for everyone who wants to work. When demand for most goods and services falls, less production is needed, consequently fewer workers are needed; wages are sticky and do not fall to meet the equilibrium level and mass unemployment results. With cyclical unemployment, the number of unemployed workers exceeds the number of job vacancies, so that even if full employment was attained and all open jobs were filled, some workers would still remain unemployed. Structural unemployment occurs when a labor market is unable to provide jobs for everyone who wants to work because there is a mismatch between the skills of the unemployed workers and the skills needed for the available jobs. Structural unemployment may be encouraged to rise by persistent cyclical unemployment: if an economy suffers from long-lasting low aggregate demand, many of the unemployed may become disheartened and their skills (including job-searching skills) become rusty and obsolete. The implication is that sustained high demand may lower structural unemployment. Seasonal unemployment may be seen as a kind of structural unemployment, since it is a type of unemployment that is linked to certain kinds of jobs (construction work or migratory farm work). There can be a multitude of other factors, too. New entrants (such as graduating students) and re-entrants (such as former homemakers) can also suffer a spell of frictional unemployment. Workers as well as employers accept a certain level of imperfection, risk, or compromise, but usually not right away; they will invest some time and effort to find a better match. This is in fact beneficial to the economy, since it results in a better allocation of resources. Productivity is a measure of production efficiency, and its level has major impacts on overall economic performance. Productivity is considered a key source of economic growth and competitiveness and, as such, is basic statistical information for many international comparisons and country performance assessments. The performance of production measures production’s ability to generate income. Labour productivity is a revealing indicator of several economic factors, as it offers a dynamic measure of economic growth, competitiveness, and living standards within an economy. Factors driving productivity growth include: investment, innovation, skills, enterprise, and competition. Productivity growth means more value is added in production, and this means more income is available to be distributed. productivity: Productivity is a measure of the efficiency of production and is defined as total output per one unit of a total input. Production is the act of creating output, which is a good or service that has value and contributes to the utility of individuals. Productivity is the ratio of what is produced to what is required to produce it. In other words, productivity is a measure of production efficiency, and its level has major results on overall economic performance. Productivity is considered a key source of economic growth and competitiveness and, as such, is basic statistical information for many international comparisons and country performance assessments. The performance of production measures production’s ability to generate income. There are two components in income growth due to performance: the income growth caused by an increase in production volume and the income growth caused by an increase in productivity. The income growth caused by increased production volume is determined by moving along the production function graph. The income growth corresponding to a shift of the production function is generated by the increase in productivity. 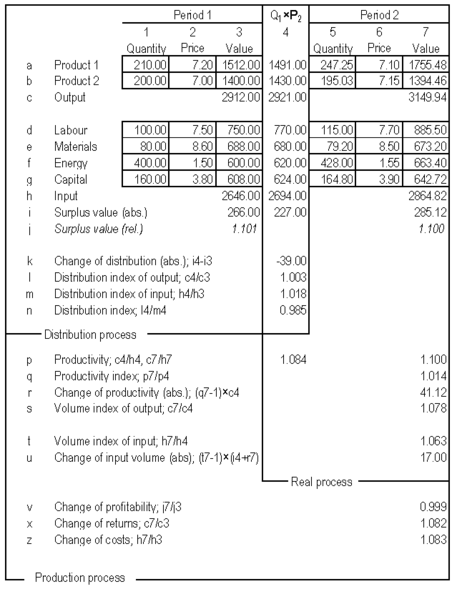 The change of real income signifies a move from Point 1 to Point 2 on the production function. When we want to maximize the production performance, we have to maximize the income generated by the production function. The Production Function: Growth in income due to production are due to an increase in production volume or an increase in productivity. With the help of productivity models, it is possible to calculate the performance of the production process. The starting point is a profitability calculation, using surplus value as a criterion of profitability. The surplus value calculation is the only valid measure for understanding the connection between profitability and productivity. A valid measurement of total productivity necessitates considering all production inputs, and the surplus value calculation is the only calculation to conform to that requirement. Surplus Value Calculation: This is an example of a model calculating surplus value, and thus measuring productivity. The results of the above model are easily interpreted and understood. We see that the real income has increased by 58.12 units, of which 41.12 units came from the increase of productivity growth. The other 17.00 units came from the production volume growth. Based on these changes in productivity and production volume values, we can explicitly locate the production on the production. There are two parts of the production function. The first is called “increasing returns” and occurs when productivity and production volume increase or when productivity and production volume decrease. 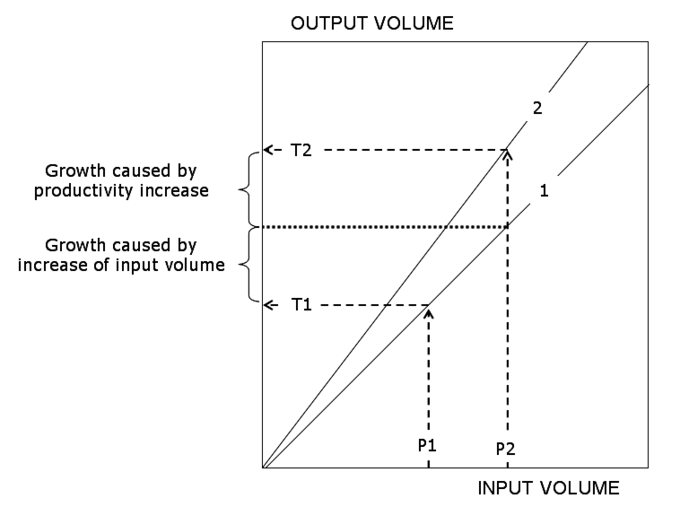 The second, “diminishing returns”, occurs when productivity decreases and volume increases or when productivity increases and volume decreases. In the above example, the combination of volume growth (+17.00) and productivity growth (+41.12) reports explicitly that the production is classified as “increasing returns” on the production function. This model demonstration reveals the fundamental character of total productivity. Total productivity is that part of real income change which is caused by the shift of the production function. Accordingly, any productivity measure is valid only when it indicates this kind of income change correctly. In order to measure the productivity of a nation or an industry, it is necessary to operationalize the same concept of productivity as in a production unit or a company. However, the object of modelling is substantially wider and the information more aggregate. There are different measures of national productivity, and the choice between them depends on the purpose of the productivity measurement and/or data availability. One of the most widely used measures of productivity is Gross Domestic Product (GDP) per hour worked. Another productivity measure is known as multi-factor productivity (MFP). It measures the residual growth that cannot be explained by the rate of change in the services of labour, capital and intermediate outputs, and is often interpreted as the contribution to economic growth made by factors such as technical and organizational innovation. Labor productivity is a revealing indicator of several economic factors, as it offers a dynamic measure of economic growth, competitiveness, and living standards within an economy. Labor productivity is equal to the ratio between a volume measure of output ( gross domestic product or gross value added) and a measure of input use (the total number of hours worked or total employment). The volume measure of output reflects the goods and services produced by the workforce. The measure of input use reflects the time, effort, and skills of the workforce. Investment: The more capital workers have at their disposal, generally the better they are able to do their jobs. Innovation: For example, better equipment works faster and more efficiently, or better organization increases motivation at work. Skills: These are needed to take advantage of investment in new technologies and organisational structures. Enterprise: This is the seizing of new business opportunities by both start-ups and existing firms. Competition: Improves productivity by creating incentives to innovate and ensures that resources are allocated to the most efficient firms. to governments through increases in tax payments. At the national level, productivity growth raises living standards because more real income improves people’s ability to purchase goods and services, enjoy leisure, improve housing and education and contribute to social and environmental programs. Over long periods of time, small differences in rates of productivity growth compound — like interest in a bank account — and can make an enormous difference to a society’s prosperity. Nothing contributes more to reduction of poverty, to increases in leisure, and to the country’s ability to finance education, public health, environment and the arts. Governments can use fiscal policy as a means of influencing economic variables in pursuit of policy objectives. Governments use fiscal policy to influence the level of aggregate demand in an economy. The effectiveness of fiscal policy in general played an important role in recent discussions surrounding the appropriateness of various government responses to recessions. Different factions of economic thought offer different theoretical perspectives on fiscal policy. Tight fiscal policy, resulting from increasing taxes and reducing government spending, can keep inflation down at the expense of increasing unemployment. Loose fiscal policy, resulting from increasing government spending and reducing taxes, can decrease the unemployment level at the risk of increasing inflation. Keynesian economics suggests that increasing government spending and decreasing tax rates are the best ways to stimulate aggregate demand, and decreasing spending and increasing taxes after the economic boom begins. Keynesians argue that this method may be used in times of recession or low economic activity as an essential tool for building the framework for strong economic growth and working towards full employment. In theory, the resulting deficits would be paid for by an expanded economy during the boom that would follow; this was the reasoning behind the New Deal. Keynesian theory posits that removing spending from the economy will reduce levels of aggregate demand and contract the economy, thus stabilizing prices. AS + AD graph: The “aggregate supply” and “aggregate demand” curves for the AS-AD model. Economists debate the effectiveness of fiscal stimulus. The argument mostly centers on crowding out, a phenomenon where government borrowing leads to higher interest rates that offset the stimulative impact of spending. When the government runs a budget deficit, funds will need to come from public borrowing (the issue of government bonds ), overseas borrowing, or monetizing the debt. When governments fund a deficit with the issuing of government bonds, interest rates can increase across the market, because government borrowing creates higher demand for credit in the financial markets. This causes a lower aggregate demand for goods and services, contrary to the objective of a fiscal stimulus. Neoclassical economists generally emphasize crowding out, while Keynesians argue that fiscal policy can still be effective especially in a liquidity trap where, they argue, crowding out is minimal, while Austrians argue against almost any government distortion in the market. Some classical and neoclassical economists argue that crowding out completely negates any fiscal stimulus; this is known as the Treasury View, which Keynesian economics rejects. The Treasury View refers to the theoretical positions of classical economists in the British Treasury, who opposed Keynes’ call in the 1930s for fiscal stimulus. The same general argument has been repeated by some neoclassical economists up to the present. Austrians say that Fiscal Stimulus, such as investing in roads and bridges, does not create economic growth or recovery, pointing to the case that unemployment rates don’t decrease because of fiscal stimulus spending, and that it only puts more debt burden on the economy. Many times, they point to the American Recovery and Reinvestment Act of 2009 as an example. In the classical view, the expansionary fiscal policy also decreases net exports, which has a mitigating effect on national output and income. When government borrowing increases interest rates, it attracts foreign capital from foreign investors. This is because, all other things being equal, the bonds issued from a country executing expansionary fiscal policy now offer a higher rate of return. In other words, companies wanting to finance projects must compete with their government for capital so they offer higher rates of return. To purchase bonds originating from a certain country, foreign investors must obtain that country’s currency. Therefore, when foreign capital flows into the country undergoing fiscal expansion, demand for that country’s currency increases. The increased demand causes that country’s currency to appreciate. Once the currency appreciates, goods originating from that country cost more to foreigners than they did before, and foreign goods cost less than they did before. Consequently, exports decrease, and imports increase. Other possible problems with fiscal stimulus include the time lag between the implementation of the policy and detectable effects in the economy, and inflationary effects driven by increased demand. In theory, fiscal stimulus does not cause inflation when it uses resources that would have otherwise been idle. For instance, if a fiscal stimulus employs a worker who otherwise would have been unemployed, there is no inflationary effect; however, if the stimulus employs a worker who otherwise would have had a job, the stimulus is increasing labor demand, while labor supply remains fixed, leading to wage inflation and, therefore, price inflation. Monetary policy seeks to further economic policy goals through influencing interest rates. Monetary policy refers to actions taken by a central bank, such as the Federal Reserve in the United States, which seek to influence the overall level of economic activity in an economy by targeting interest rates or the money supply. Expansionary monetary policy seeks to lower interest rates or increase the money supply, allowing money to be acquired more easily, increasing economic activity in an economy. Contractionary monetary policy will increase interest rates or reduce the money supply, making money ( loans, etc.) more difficult to acquire and, thus, reducing (or at least reducing the growth rate of) economic activity in an economy. The Federal Reserve System (the Fed) can initiate monetary policy through open market operations, or by changing reserve requirements or the discount window lending interest rate. monetary policy: The process by which the government, central bank, or monetary authority manages the supply of money, or trading in foreign exchange markets. In every country, the government takes steps to help the economy achieve the goals of growth, full employment, and price stability. Through monetary policy, the government exerts its power to regulate the money supply and level of interest rates. Through fiscal policy, it uses its power to tax and to spend. Monetary policy is exercised by the Federal Reserve System (“the Fed”), which is empowered to take various actions that decrease or increase the money supply and raise or lower short-term interest rates, making it harder or easier to borrow money. When the Fed believes that inflation is a problem, it will use contractionary policy to decrease the money supply and raise interest rates. In theory, when rates are higher, borrowers have to pay more for the money they borrow, and banks are more selective in making loans. Because money is “tighter”more expensive to borrow–demand for goods and services will go down, and so will inflation. To counter a recession, the Fed uses expansionary policy to increase the money supply and reduce interest rates. With lower interest rates, it’s cheaper to borrow money, and banks are more willing to lend it. We then say that money is “easy. ” Attractive interest rates encourage businesses to borrow money to expand production and encourage consumers to buy more goods and services. Since the 1970s, monetary policy has generally been formed separately from fiscal policy. Even prior to the 1970s, the Bretton Woods system still ensured that most nations would form the two policies separately. Within almost all modern nations, special institutions (such as the Fed in the United States, the Bank of England, and the European Central Bank) exist which have the task of executing the monetary policy, often independently of the executive. In general, these institutions are called “central banks” and often have other responsibilities, such as supervising the smooth operation of the financial system. The beginning of monetary policy as such comes from the late nineteenth century, where it was used to maintain the gold standard. Monetary policy rests on the relationship between the rates of interest in an economy (the price at which money can be borrowed) and the total money supply. Monetary policy uses a variety of tools to control one or both of these in order to influence economic growth, inflation, exchange rates, and unemployment. Where currency is under a monopoly of issuance, or where there is a regulated system of issuing currency through banks which are tied to a central bank, the monetary authority has the ability to alter the money supply and, thus, influence the interest rate (to achieve policy goals). All have the effect of contracting the money supply and, if reversed, expand the money supply. Usually, the short-term goal of open market operations is to achieve a specific short-term interest rate target. In other instances, monetary policy might instead entail the targeting of a specific exchange rate relative to some foreign currency or else relative to gold. For example, in the case of the United States, the Fed targets the federal funds rate, the rate at which member banks lend to one another overnight; however, the monetary policy of China is to target the exchange rate between the Chinese renminbi and a basket of foreign currencies. A policy is referred to as “contractionary,” if it reduces the size of the money supply or increases it only slowly or if it raises the interest rate. An expansionary policy increases the size of the money supply more rapidly or decreases the interest rate. Furthermore, monetary policies are described as follows: accommodative, if the interest rate set by the central monetary authority is intended to create economic growth; neutral, if it is intended neither to create growth nor combat inflation; or tight, if intended to reduce inflation. MB, M1 and M2 aggregates from 1981 to 2012: These are the aggregates for MB, M1, and M2, as taken from the St. Louis Federal Reserve’s aggregate graph generator.